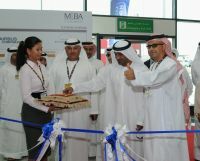 The show was opened by HH Sheikh Ahmed Bin Saeed Al Maktoum, President, Dubai Civil Aviation Authority and Chairman of the Emirates Group and Dubai Airports, who spent two hours touring the show site and visiting booths. He was one of the 50 rulers and members of royal families from the UAE, Saudi Arabia, Oman, Kuwait and Qatar that visited the show. 7,500 visitors attended the show enjoying the unusual location in what will be the low-cost carrier terminal (there was even a duty free shop open!) and the static booth which had 48 aircraft on display. The mood was generally upbeat and positive even though sale announcements were slow. General consensus agrees that the region’s business aviation activity remains steady. Dave Edwards, Managing Director of Gama FZE, commented that the Middle Eastern charter market had experienced a small increase over the last couple of years with longer range flights being the norm. As the market is still relatively young (compared with the USA and Europe) there seems to be a lot of potential for those operating in the region. The Middle East Business Aviation Association (MEBAA) Chairman Ali Al Naqbi supports this stating in an ambitious forecast that the local business aviation market could be worth US $1bn by 2018. “Quite simply there is huge growth potential here”, he said. “Regional business aviation traffic has risen 12% in the past year and its installed fleet will expand from the current 500 to 1,300 aircraft by 2020”. However the region isn’t without its own unique challenges. At a pre-show symposium issues such as the lack of suitable regulations for business aviation, the effects of political instability of the Northern African countries, and the amount of grey market/illegal charters were all highlighted. Aoife O’Sullivan, Partner of Gates and Partners the dedicated aviation law firm, said that the illegal charter market continues to be a major problem which is hampering genuine operators growth. O’Sullivan suggests that clearer definitions of what an illegal charter is would go some way to help the market understand the significance of the problem. It is such an important issue that at the same symposium a dedicated working committee was initiated to tackle the issue. O’Sullivan will be joined by Dave Edwards, James Dowlen, Partner at Chartis Insurance and Ali Al Naqbi, MEBAA chairman, who agreed to take on the task of stamping out the majority of illegal charter within three years. Despite the issues optimism abounded as new partnerships, developments and a single sale were announced. Dassault Falcon finalised the sale of a pre-owned Falcon 900EX EASy II and a new, tri-engine Falcon 900LX to Saudi Arabia’s Wallan Aviation. Wallan plans to operate both aircraft and have the option to offer one or both to the charter market. This is Wallan’s first foray into the large cabin segment. 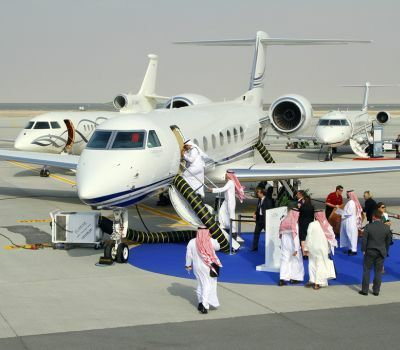 Abu Dhabi-headquartered Royal Jet unveiled plans for fleet expansion and refurbishment in 2013. 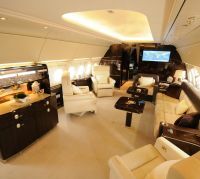 “Royal Jet is currently investing $9 million in the interior refurbishment of its Boeing Business Jets”, explained Shane O’Hare, President and CEO of the international luxury flight services company. “We are also assessing our long-term fleet plan, which would include replacement of the existing BBJ fleet by 2016”. Gama Aviation announced it has added an Embraer Legacy 600 and a Challenger 604 to its UAE charter fleet and an Embraer Legacy 650, Hawker 800XP and VIP Boeing 737 to its growing management fleet in the region. Expanding aircraft sales brokerage Viation signed an exclusive agreement with PrivatAir of Switzerland to become its broker for business aircraft transactions worldwide. Viation will support the Geneva-based charter and management company which serves blue chip clients in the medium to large jet business aircraft sector globally. The agreement between Viation and PrivatAir will focus primarily on super mid-sized jets and upwards. The first aircraft being presented by the two companies is a 2010 Global 5000, which was on display. Out on the static AMAC Aerospace exhibited for the first time with Pilatus. Appointed exclusive sales distributor for the region in January 2012 AMAC is experiencing increasing demand for the versatile, high speed turboprop. Kadri Muhiddin, CEO of AMAC Aerospace commented: “The Pilatus can fulfil multi-role missions from accommodating up to nine passengers, acting as a cargo aircraft, use as an air taxi, serving as an air ambulance or special mission role, all attributes which appeal to certain Middle East customers”. The Pilatus interest levels demonstrate that the Middle East is not exclusively the domain of the big jet market. Making its debut was the Embraer Legacy 650. This large-cabin jet features a new interior with three zones hosting up to 14 passengers. Embraer already has 35 earlier Legacy types in service in the Middle East. Airbus Corporate Jets displayed one Airbus ACJ318 and one Airbus ACJ319 and used MEBA as the opportunity to present its new Gala and Enhanced cabin concepts. The ACJ318 Enhanced features a cabin upgrade and wider choice of options for clients. This is complemented by improved versions of the Airbus ACJ330 which, together with the ACJ340, can provide a new wide-body cabin package called the Gala concept. 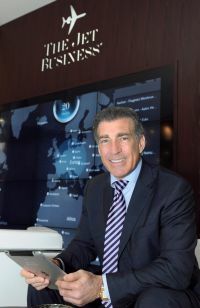 New exhibitors included The Jet Business, a London-based business which boasts the world’s first executive jet showroom enabling visitors to select, via a smart app, the most suitable aircraft for their needs. Independent of any OEM founder Steve Varsano has changed the way pre-owned aircraft have been sold. Varsano was presenting a new interiors app that enables clients to visualise their business jet cabin in a full-size replication. Evergreen Apple of Nigeria, also first time exhibitors at the show, used MEBA as a means of promoting their recently achieved Approved Maintenance Organisation service status and demonstrating their commitment to a full maintenance service strategy for aircraft flying through Lagos. “The Middle East market is important for us and MEBA offers a good opportunity to forge new relationships”, said Evergreen’s CEO Segun Demuren. Africa was also represented by the African Business Aviation Association who announced the acceptance of their 19th Founder Member Dubai based HADID International. It seems the boundaries between the Middle East and Africa are melting away as the energy sector requires more interaction between the regions.